Gravity is a familiar force and is central to astrophysics. Our best theory of gravitation is Einstein’s general relativity (GR). This tells us that gravity is the bending of spacetime by matter. I am working on finding out what we could learn from observations of strong gravitational fields, where the curvature of spacetime is greatest. Of particular interest to me is what we may be able to learn by measuring gravitational waves (ripples in spacetime). Detecting gravitational waves is extremely challenging. I am currently working as a member of the Laser Interferometer Gravitational-wave Observatory (LIGO) Scientific Collaboration. Advanced LIGO started observations in 2015 and made the first observation of gravitational waves from a binary black hole merger. During my PhD, I was interested in what we could measure with the planned Laser Interferometer Space Antenna (LISA), a space-based detector. In a few years, we may be able to do multi-band gravitational-wave astronomy! I want to know both what we could learn about astrophysical objects, such as black holes or neutron stars, from gravitational tests, and what we may be able to learn about the nature of gravity itself. More detailed information can be found in my publications. Having measured a gravitational wave, it is a difficult task to work out the properties of its source system. There are a number of techniques used for estimating the parameters of the gravitational waves, such as Markov-chain Monte Carlo. Most of my time is spent working as part of LIGO’s Parameter Estimation group on inferring the properties of compact binary coalescences. I analysed the first detections made by LIGO, and led the analysis of GW170104. Detecting a gravitational wave is exciting, is even more exciting to find an electromagnetic counterpart. Pointing telescopes in time for there still to be something to see is difficult. I have studied how well we can locate gravitational-wave sources on the sky, and cunning techniques for three-dimensional localization. We need models for the waveforms, but we are not certain of their exact form. I have investigated how to include our uncertainty in the waveforms into our parameter-estimation codes. The information we obtain from gravitational waves can potentially teach us about how their sources formed. Ilya Mandel likes to say that with observations of black hole and neutron star binaries we are doing stellar paleontology—we are inferring how stars live and die from the remains they leave behind. The COMPAS team are particularly interesting in this area, and how we can use gravitational-wave observations to understand the uncertain physics of binary evolution. In CIERA, we are working on building more accurate models for how binary systems form and evolve, and how to understand the information provided by the population of our gravitational wave observations. I am excited about figuring out what we can learn from our gravitational wave observations, and how we can combine these with other astronomical data. One of the main sources of gravitational waves for LISA will be extreme-mass-ratio (EMR) events. These form when a compact object, such as a neutron star or stellar mass black hole, orbits close to the massive black hole found in the centre of a galaxy. As the compact object orbits, it generates gravitational waves. These carry away energy and momentum, making the orbit shrink, as well as encoding information about the shape of the spacetime background. I have studied EMR bursts, short gravitational waves emitted when the orbit is still highly eccentric. These could be a useful way of learning about the massive black hole at the centre of the Milky Way. Unfortunately, I calculated that the event rate is low, so we would have to be lucky to observe one. As the orbit evolves its frequencies change. When the frequencies of the radial and polewards motion become multiples of each other, the system undergoes a transient resonance. There is a small glitch in the inspiral. I have found that this shouldn’t significantly impact our ability to detect inspirals, but could have interesting consequences for measuring their properties. We’re currently uncertain of the rate of inspirals. This is great, as it means when we’ve measured the rate, we will have learnt a lot! We have performed a systematic study of all our astrophysical uncertainties, and concluded that even under the most pessimistic assumptions, there should be a few signals LISA will spot. Using these, we can start to reconstruct the distribution of massive black holes lurking in galactic centres. General relativity has passed every observational test so far. However, so far these tests have been confined to weak fields; the most exciting tests are the ones that probe strong fields, where spacetime is highly dynamic and the objects are extremely relativistic. 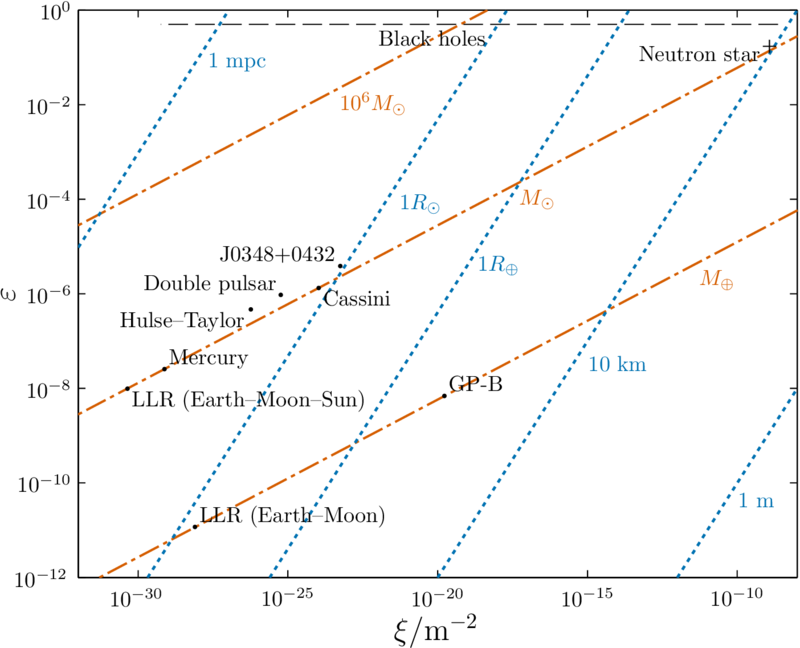 These are the regions where GR is most likely to break down, and are exactly the region that gravitational waves probe. Tests of GR plotting as functions of gravitational potential and spacetime curvature . Current tests probe a wide range, but are yet to reach the most extreme regimes close to the surfaces of compact objects. The dashed line represents the event horizon of Schwarzschild black holes. I have therefore investigated what differences might be observed in an alternate theory of gravity: -gravity. This is one of the simplest extensions to GR. For the class of theories I studied, I concluded that laboratory tests are more sensitive than astrophysical ones, although both are useful as they probe different regions.